Sometimes it pays to be brave, sometimes it doesn’t. Better luck next time, Renault. By the final decade of the 20th century, motor manufacturers, having established that engineering integrity would only take them so far in the quest for market leadership, began to realise that the answer to their prayers lay within the spreadsheets and focus groups of the product planning departments. In a mature market, largely populated by feckless new money garnered from illusory internet start-ups and awash with cheap credit, the differentiator between the automotive carnivores and their prey would be defined by one word: Segmentation. Entire departments sprang up in such demographically significant hotspots as Miami, London and Southern California, all tasked with seeking that elusive niche that would give the parent company a jump on their rivals. Getting to market first with a fresh concept, executed well, has been shown to grant the originator ownership of the sector – witness the Range Rover’s command of its market, some 40 years after its introduction. As world auto markets became populated almost entirely by clones of one another, it’s become more and more difficult to establish anything truly novel. So when car manufacturers claim to have reinvented the wheel with a newly minted niche, just how believable are their claims? To find out, we’ll be looking at three distinct (and distinctive) marque-specific explorations into the product planning tundra in an attempt to sift through marketing fluff and hyperbole, and discern whether there really is such a thing as new. All three are coupés albeit, polarisingly diverse derivations of the coupé concept. Each however share one one characteristic: they occupy a trope of car design tailor-made for its era. One where want trumps need, where aspiration tramples utility. The CLS was part of Daimler-Benz’s expansionist vision which saw Mercedes diverge into previously inviolate sectors of the market – a move which took the world’s oldest car manufacturer’s ethos away from its core engineering-led roots and placed it into the realm of ephemera. The W219 was conceived to take the fight to arch-rival BMW’s newly launched and radically styled 6-Series coupé and with Mercedes engineers referring to it as the ‘Jag-fighter’; to rub uncle Henry’s nose in the mud while they were at it. Mercedes’ confidence was high, and the Sindelfingen factory primed to produce 30,000 CLS models per year. The CLS’ styling proved something of a Rubicon for the marque – signifying a move away from its characteristic formality of line to a highly emotive language – one that was to become normative in the years that followed. Its appeal lay in its otherness – lacking the studied rationality of its forebears, it appealed to buyers who would hitherto have eschewed Stuttgart-Untertürkheim’s finest. It became that rare animal – a Mercedes that inspired true devotion in its followers – of which there proved to be many. It was predictable that Daimler-Benz’s German rivals would offer a riposte but what was more surprising was the manner and speed in which they did so, not to mention the relative success of their efforts. The CLS was a both a significant and successful car for Daimler-Benz – and the final production total over the six years of the W219’s lifespan topped 170,000 – something that couldn’t necessarily be said of other niche models the firm produced during this period. Indeed, its commercial success was tipped at the time to inspire a tsunami of imitators, which have in fact been slow to materialise. Just as Mercedes-Benz were preparing the concept that prefigured the CLS in 2003, Renault was retreating from its own adventure into niche-exploration. By the mid-90s Renault was famed for brilliantly inventive and well executed concepts from Patrick Le Quement’s dream factory. Renault would show these cars, the motoring world would swoon and that would be that. Should a production version eventually emerge, it was certain to do so as a pale shadow of the concept. So when Renault previewed the Coupespace concept in 1999, few at the time believed they would have the nerve to produce it. 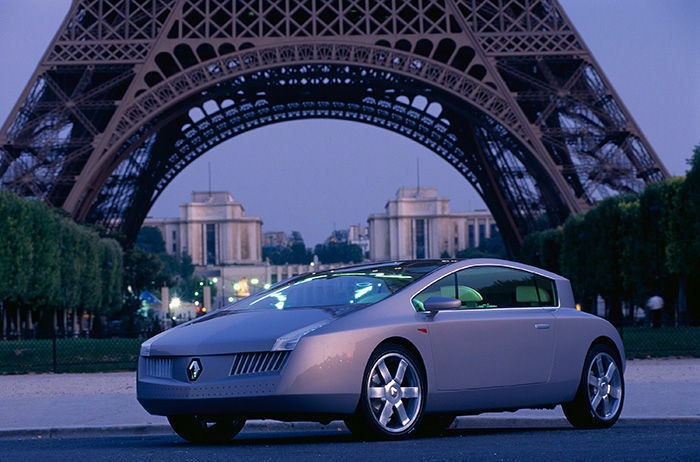 But when it launched in 2001, the Avantime proved to be a carbon copy of the concept. It was intended to be a keystone of Renault’s ambition to reposition itself within the European automotive firmament. Renault had lately emerged from state ownership and management saw clearly that in order to survive within a fundamentally changing landscape, it was going to be necessary to escape from the mass-market into the marginally calmer waters of the upper echelons. Under the ‘Createur d’Automobiles’ tagline, Renault planned a range of individualistic, distinctly French upmarket cars – with the emphasis firmly on design innovation and a very Gallic notion of luxury. Originally the brainchild of Matra, the initiators of the successful Espace series and conceived along similar lines, the Avantime was pitched as something genuinely novel. A tall-bodied mono-space coupé or a sexed-up Espace for those of a more cynical mein. Utilising a steel spaceframe clad in composite and aluminium panels, the Avantime was to be a resolutely selfish vehicle – a denial of everything the MPV concept stood for. Despite its size, it was strictly a four seater – the thinking being that it would appeal to ’empty-nest’ Espace owners; influenced by an increasingly ageing demographic within Europe. Style was all – from its pillarless side windows, elaborate and beautifully engineered door hinges, to its aluminium roof and ‘squiggly’ tail-lights, the Avantime was French design quirkiness writ large. The motoring world was suitably impressed and despite a few dissenting voices, the reception was broadly favourable. Due to its size and Espace underpinnings, the Avantime was no driver’s car however. What it was though, was supremely comfortable in the French Grand Routier fashion. But as with many French delicacies, not all palates would prove receptive and from 2001 to its withdrawal a mere two years later, a mere 8,500 examples were produced. Renault’s retreat was both ignominious and costly, and the same motoring correspondents who previously lauded Renault for its bravery reacted with barely concealed schadenfraude. But what went wrong? One of the problems with aiming any product at the empty nest brigade is that it virtually guarantees that younger buyers will avoid it like the plague. Worse still, the demographic at which it was initially aimed is as likely to eschew it as well. After all, who wants to wear orthopaedic shoes, when you can have Nike’s? In aiming the Avantime at such an unfashionable audience, Renault ensured its image was irredeemably tainted. Add to this the lack of cachet in the Renault brand and you have an interesting concept but essentially, the wrong one, simply because the fundamental premise was flawed. Several years on of course, the car is viewed as something of a forgotten masterpiece and design classic – but then, nobody said life was fair. During the late ’90s, Chris Bangle was appointed Director of Design at BMW. Determined to shake up the entrenched attitudes amongst the stylists and engineers at BMW’s Forschungs und Innovationszentrum R&D center in Munich, he tasked them to come up with a game-changer – ‘a leap of faith’. He named the project, “Deep Blue” with the aim of imagining the successor to the SUV, and sent a group of designers to California for 6 months, basing themselves at Elizabeth Taylor’s former home in Malibu. Deep Blue brought forth many advanced concepts, but one that saw the light of day was a car that, like the Avantime and Mercedes CLS, was to answer a question that has remained resolutely unasked. 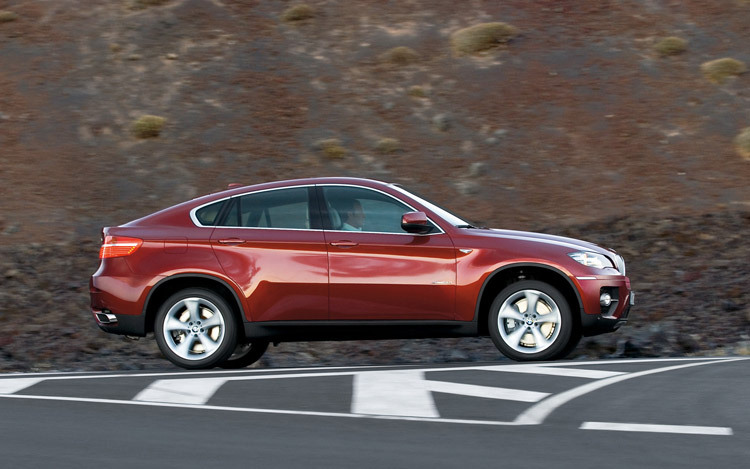 The 2008 BMW X6, whatever one thinks of the car’s styling, set a new watermark. Dubbed a ‘Sports Activity Vehicle – (SAV) by BMW, the X6 was essentially an X5 coupé and like the Renault and Mercedes, set out to test the appetite of the market for novel/pointless concepts. Pierre Le Clercq’s styling certainly proved divisive – as commentators and enthusiasts converged to throw rotten fruit BMW’s way. It certainly isn’t an attractive shape, looking akin to a creature in the process of metamorphosis; a caterpillar forever denied its butterfly. However, the car proved an instant hit with buyers and remains so – especially in its intended US and far-Eastern markets. With sales of over 190,000 in five years, the X6 certainly demonstrates that Bangle’s Deep Blue team had done their homework. The X6 can also lay claim to creating an entirely new niche, one Land Rover has subsequently mined successfully with their smash-hit Evoque model. Work is progressing on both the next generation X6 and its baby X4 brother and it is likely that these new models will continue BMW’s stellar growth in this most vibrant and lucrative of all car sectors. So anyway, lets get back to this question of novelty – were any of these concepts genuinely new? Certainly, the 4-door coupé can be said to date back to the late 1950’s with Cadillac’s Eldorado Brougham and innumerable others since. There have also been several attempts to combine coupé styling and SUV practicality – indeed Porsche had been playing with such things during the 1990s before they stunned the world with the Cayenne. So it is perhaps only Renault/Matra, the abiding failure of our trio, that can lay claim to genuine innovation. But behind the savage irony is one essential truth and it is this: attempting something truly novel is fraught with pitfalls and is very, very expensive. Get it wrong and you will end up with burnt fingers and vats of red ink. Mention the Avantime to a Renault executive today and you are likely to be met with a quiet sob or a dismissive gesture. Oh yes, hindsight is often very sturdy ground, but someone at Renault believed there was a market for an Espace coupé. There wasn’t, just as there isn’t one for the Mercedes R-Class or the BMW 5-Series GT – abject failures all. Basically you need very deep pockets to go playing in the niche-sandpit. Mercedes-Benz and BMW can afford to experiment with segmentation and while the world is vastly different now to the one the original CLS and X6 were born into, the fact remains that both were rewarding experiments for their creators. The key to both car’s success, ironically, has probably a lot to do with the conservatism of the market and the fact that it was the mighty German luxury marques doing it, not some jumped-up pantry boy who never knew his place. So will we ever see another coupé-MPV? It’s unlikely, especially as the market has firmly decided it prefers SUV crossovers to large ‘people-carriers’. Understanding the trends from California, Beijing or Nizhny Novgorod matters more these days and it is in the realm of market intelligence that the German marques, (and BMW in particular), have the edge. With massive R&D budgets, the German ‘big three’ can afford the odd miss-step. For the likes of Renault however, such experiments are, in the current climate at least, unconscionable. Because the grim truth is that in the automotive business, unless you’re one of the German ‘big three’, playing in the niche sandbox is a potentially ruinous business. A lovely article Eoin, thank you. I am not one of those who consider the Avantime anything but misguided however. I applaud the bravery of Renault in their attempt to win over buyers with something truly novel, but it was also a flawed genetic combination. They added the worst features of the MPV and the coupe and created something even worse still. I still cannot understand why (aside from the hinges) anyone would be tempted to buy one. Imagine if it had been made by Kia, would it be so feted? No, it would not- but since it is French we can excuse such foolishness fondly rather than simply see it as a farce. The CLS and the X6 do have the benefit of strong badges as you mention, however the 5GT and R class also mentioned show that people don’t aspire to buy something suitable, simply something that can be adapted to suit. Better yet if it gives a sense of sporty individuality and risk (which can be determined via a matrix of peer approved predefined KPIs on your personality). The Avantime can’t be adapted because unlike the X6 it can’t pretend to go off road and unlike the CLS it looks about as sleek as a hippo in hosiery. What it could have done is acted as a halo model for a range of cars that embraced this odd design as a point of difference. But after this and the Vel-Satis, they lost their nerve and we now have French cars from Renault that are trying to be German cars from VW. The automotive world appears to view the Avantime with the sort of retrospective regard that should have ensured its success when it was new. Renault’s problem was that it liked Le Quement’s vision, but hadn’t the nerve (or funding) to carry it through. In retrospect, amidst Renault’s many excellent concepts, I can think of several that would have made a more convincing prospect than the one they adopted. Yet it is regarded as being an honourable failure. Interesting. (Frankly, I’m with you on the merits of the design). The Mercedes CLS was there first design in a long time that had caught my eye. The sleek “expressive” design coined the nick name “banana Merc.” I went to see one at the dealer when they were released. I found that I was attracted to the close coupled, cozy interior, not entirely practical as a family car but it appealed to me emotionally. Similar in my attractions to the earlier classic Jaguar XJ6 designs. There was also a Maybach sedan on display. This turned out to be a niche market that never materialized, What was the production like on these vehicles. Next Next post: A Road to Nowhere?